Tom Browne is a jazz trumpeter who rose to prominence first through his early work with Sonny Fortune, and scored two major hits in 1980 and 1981: the No. 1 R&B single “Funkin’ for Jamaica” and the No. 4 R&B single Thighs High. 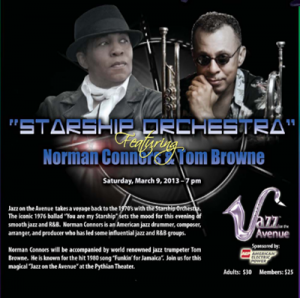 Jazz On The Avenue presents “Starship Orchestra” featuring Norman Connors and Tom Browne at the King Arts Complex (867 Mount Vernon Ave.) on Saturday, March 9th, at 7pm. Tickets are $30, $25 for King Arts members.